Calluses are caused by repetitive friction against the skin and are common in people who weight train. 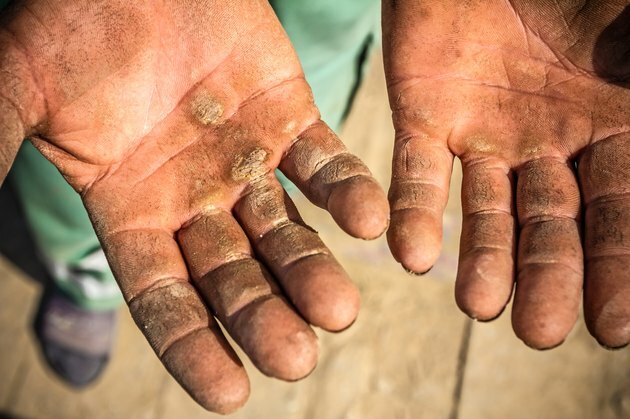 While some lifters see calluses as a badge of honor that shows they do regular workouts, other people find this buildup of tough and sometimes painful skin unpleasant. While wearing special training gloves can help reduce the formation of calluses, sometimes it is necessary to take action to reduce or completely remove the excess skin growth. Pour the Epsom salts into medium-sized bowl of warm water, and mix thoroughly. Place your hands in the bowl and relax. Soak your hands for 5 to 10 minutes. Take the pumice stone in one hand and open the palm of your other hand to expose your calluses. Rub the calluses with the stone. Do the same with your other hand. Because your skin is wet and soft, the pumice stone should rub the top and previously tough outer layer of the callus away. Dry your hands and examine your calluses. If there is any remaining hard skin, carefully trim away the remaining callus with the scalpel. If necessary, use the pumice stone again to file down frayed edges. Dry your hands and apply the moisturizer to the entire surface of your hands, paying extra attention to the areas that were previously callused. Spend a few moments massaging the areas where calluses form. If possible, leave a thin layer of moisturizing cream on your hands so it can soak into your skin. Perform this routine weekly or whenever you notice your calluses returning. When using the pumice stone, rinse your hands regularly to clear the debris so you can assess your progress. Do not remove too much callus with the scalpel blade, because you may cut through into live skin, causing an injury and pain.